Fly to Siem Reap, Cambodia, where you’ll see the magnificent Temples of Angkor. The famous temples here, such as Angkor Wat and the Bayon temple, featuring some 200 mysterious faces carved in its many towers, are a display of intricacy and architectural grandeur unmatched in the world. 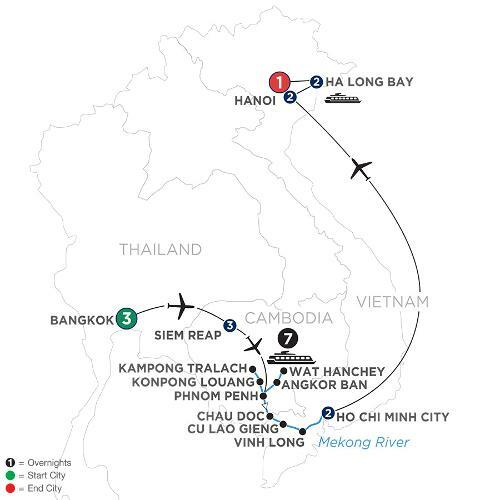 Next, board your ship and begin your cruise along the mighty Mekong River. Visit the capital city of Phnom Penh, with the magnificent Royal Palace featuring its striking Silver Pagoda and the National Museum. Take in the stunning views at the 8th-century temple of Wat Hanchey before walking through the rural village of Angkor Ban to visit with welcoming schoolchildren. Disembark your cruise ship and fly to Hanoi, where you’ll explore the famous Old Quarter with peddlers trading goods among its 36 ancient streets. From here, travel to Ha Long Bay in the Gulf of Tonkin, where you’ll be amazed at the more than 3,000 limestone islands of varying shapes. Enjoy a 2-night cruise along the bay with visits to the Cua Van Floating Village, fascinating caves, and a chance to swim at Ti Top Island. The beautiful scenery, ornate temples, and interactions with locals make this Southeast Asia river cruise vacation one you won’t soon forget! Participation in this vacation requires purchase of the following flights from Avalon Waterways, not included in pricing: (1) roundtrip air from your U.S. gateway and intra-vacation air segments; or (2) intra-vacation air segments only, starting at $600. Required intra-vacation air segments: Bangkok/Siem Reap; Siem Reap/Phnom Penh; Ho Chi Minh City/Hanoi. Air prices were effective on February 6, 2019 and their availability is limited. At the time you purchase your tour, air prices may be higher. All prices are per personbased on double room occupancy. Cruise price based on Category B in an Panorama Suite on Mekong Deck. To upgrade to a Category A on Tonle Deck, add $400 per person or $800 in single occupancy.